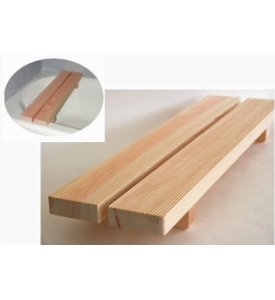 Turn your Tub into a Steam Room or Sauna by placing this great Hinoki Wood Tub Bench in place. Then have a seat and relax while you enjoy a bath/shower steam treatment. Or just use as a bench during shower time or a reading/beverage table during bath time. Hinoki, or Japanese cypress, has long been prized for its natural antibacterial agents and its resistance to humidity. Both make it ideal for bathing accessories. The highly therapeutic wood contains minerals and essential oils traditionally used in Japan to treat skin irritations and reduce stress. The bench seats you comfortably for personal care. Hinoki (Japanese cypress) is grown in Japan under strict control. Since WW II, over 1 million acres of new forest have been planted and legislation regulates the sustainable harvest of this precious resource. All of the Hinoki products that we sell are made from 100% by-product wood that results from the thinning of forests which is required to maintain healthy growth. Creates a spa at home! Unfortunately, this item is no longer available from the supplier and we are actively seeking a new supplier. Please contact us if you know of anyone able to supply U.S. retailers with this product. We hope to have these back soon. Need a Shower Stool instead? Click here for the Hinoki Wood Sauna/Shower Stool! "I’ve tried the bench in my shower/tub and it’s exactly what I wanted. When shopping for a tub bench, I considered other options from other vendors in teak, cedar and pine, but I am glad I went with the Hinoki bench. The bench is reasonably priced, well-sized, attractive and highly functional. The faint smell of cypress is a pleasant extra. I would recommend this bench to others."